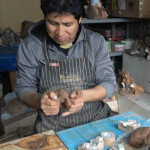 Born on a ranch in Callao, Peru, Richard picked up his love for ceramics thanks to his older brother, Victor. 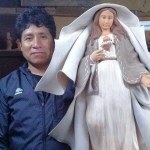 Victor discovered his talent for ceramics in 1981 when, as a teenager, he visited his parents’ hometown in Ayacucho. There, surrounded by artists, he naturally picked up the craft, experimenting with clay and taking advice from his aunts.